I love running and there is something serene about running out in the winter while the snow is falling. Just the sound of your feet crunching the snow - so peaceful. I discovered a new running trail in a friend's neighborhood. While I didn't take these pictures during my run (that would really something, lugging around a big camera while running), I drove back later in the day to capture some of what I saw. It was no longer snowing so some of the 'snow globe magic' was no longer present, but I was able to take my time to enjoy the beauty around me. I applied several Kim Klassen textures to the pictures of the grasses. We are due for more snow on Tuesday so I expect this isn't the last snow pictures you will see featured this week. I'm linking up to Mary at the Little Red House and Mosaic Monday. I hope your week is off to a wonderful start. Gorgeous snow photos...I love them!!! 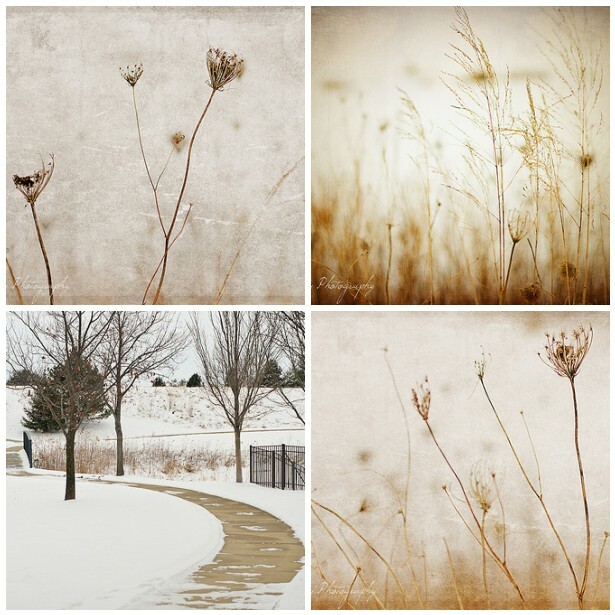 I love photographing grasses and these are just gorgeous against the backdrop of the snow. 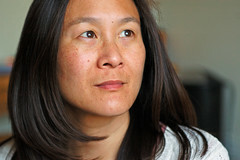 Thankyou for sharing your beautiful blog with us - I have enjoyed scrolling through it - and have a wonderful week. Gorgeous layers of Winter. Stunning work. Stunning photos in the mosaic. Yes we are also getting more snow tomorrow. I love photos of grasses. It's almost like the breeze that moves them reaches me. They are great! I think my favorite is the one on the top right. 364 and 365/365 - Happy New Year!